If checked, this option causes AB Commander to set up a hot key. If selected, this option lets you instruct Windows to run AB Commander instead of Windows Explorer when you press the WINDOWS+E key combination. If selected, this option lets choose between AB Commander and Windows Explorer, when you press the WINDOWS+E key combination. If selected, this option lets you choose a different key combination to run AB Commander. The WINDOWS+E key combination would still be available to run Windows Explorer. 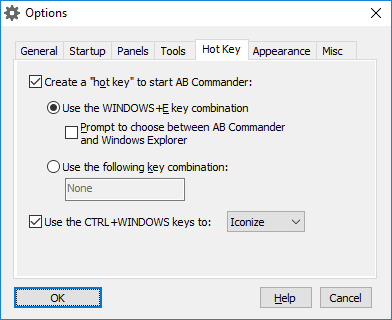 If selected, this option enables you to use the CTRL+WINDOWS key combination to quickly exit, minimize, or iconize AB Commander.